Many Spanish words used at the missions have become part of our language today. Other words are useful to understand the missions themselves. Adobe – a compound made of natural clay, sand, and straw or dung. The mixture was pressed into molds and then baked in the sun to form durable bricks. Alta California – literally, “upper California,” the Spanish name for the administrative area extending north from San Diego. Today this region is encompassed within the modern state of California. Asistencia – a sub-mission, or mission extension. These met most of the requirements of a mission, but often did not have a resident padre. Baja California – literally, “lower California,” the Spanish name for the administrative area south of San Diego. Today Baja California is one of the 31 states of modern Mexico. Campanario – a bell wall or tower. Campanarios were prominent features of most missions. Camposanto – a cemetery. The burials and grave markers in the mission camposantos provide a great deal of information for historians. Chapel – a church, or place of worship. Many of the missions started with small chapels. Even when larger churches were built, a separate chapel was often maintained for use by the padres. Convento –housing for members of the mission community. Convento may also refer to a hospice or guest house. El Camino Real – literally “The Royal Road,” a trail linking the California missions. Estancia – literally a “station” – a ranch or farm built to provide food and other important supplies for a mission. Franciscan – a member of the religious order that built the California missions. The Franciscan order was founded by St. Francis of Assisi in 1209. Fresco – a type of painting, applied to wet plaster, used to decorate many of the missions. Friar – a member of a religious order. The missions were founded by friars of the Franciscan order. Most of the friarswere not padres. Ladrillo – a kind of flat tile, made of adobe, often used for roofing at the missions. Lavenderia – literally a “laundry,” often used to refer to any place for washing and bathing. Mission – a religious community. 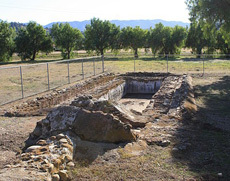 Twenty-one missions were built in Alta California by Spanish padres to spread the Catholic faith. Neophyte – a convert to a religious order. When Indians joined the mission communities, they were consideredneophytes. Padre – literally, “father” – the Spanish word for a priest. Each of the missions had at least one padre in residence.Asistencias usually did not have their own padre, but they would be visited regularly by a padre from the main mission. Plaza – a square, usually at the center of a town. Many missions were built around, or adjacent to a plaza. 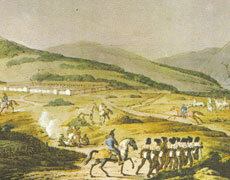 Presidio – a military fort or prison. 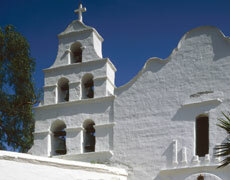 The California mission system was paralleled by five presidios, which were intended to defend the Spanish lands and settlements in Alta California. Pueblo – the Spanish word for a little town or village. The Spanish often used the word pueblo to refer to the Indian villages. Rancho – the Spanish word for “ranch.” Many of the missions had extensive ranchos to provide beef and leather for the growing mission communities. Secularization – the Mexican government ordered the mission buildings and the surrounding lands to be removed from control of the church, and turned over to the Indians who had served the missions. Vaquero – the Spanish word for “cowboy.” Many vaqueros were needed to work on the mission ranchos. Download a printable vocabulary list. by Louis Choris in November 1817.